In December 2003, Ms. Gloria Lauris, a Canadian, was visiting Egypt with her husband, Dr. Ismail Elkholy and son Ali, and seeing relatives there. 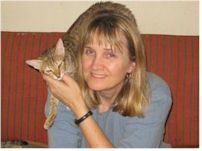 Having recently acquired a silver Mau, Tazo, from the only Canadian breeder of Maus at that time, she hoped to bring back a Mau from the homeland as a pet companion for Tazo. She soon discovered that there were no breeders of Egyptian Maus in Egypt. The locals didn't understand what a Mau was or that it was famous and popular (and rare) outside of Egypt. There were a few pet stores, but they only kept "Shirazi" cats, or imported long-haired type cats like Persians. The Maus were running feral on the streets in deplorable conditions and were considered unclean and undesirable. Ms. Lauris decided at that time to do what she could to help the Maus' current situation, and to make them more accessible to those who wished to get an original, native Mau from the homeland. Thus, EMRO was born in concept. EMRO's website started in the fall of 2004 with voluntary support from some forward-thinking and helpful Mau breeders in the US, Canada and NZ. Emotional and practical support and advice also came from other groups in the UK as well as newly created animal shelters in Cairo, who welcomed EMRO as another group wanting to help the welfare of animals in Egypt. After almost a year of administration, EMRO was able to obtain non-profit status as a charity (Aug 2005). A potential sanctuary space was purchased with Ms. Lauris' and Dr. Elkholy's retirement savings, and clean-up was started in the fall of 2005. Also, an office space was set up in a suburb of Cairo (Al Mokattam), where Ms. Lauris has set up the EMRO headquarters (HQ), which is also the adoption and sponsorship center for tame Maus. EMRO vet clinic is functioning for the surrounding area, plus the EMRO suite (a 2 bedroom furnished apartment) is available for rent to outside visitors to Cairo. The sanctuary for feral Maus in Giza was bought and resold due to lack of financial aid, although HQ in Mokattam is fully operational as a shelter. All monies received go back into the system to help more Maus to a better life either locally or abroad. Our vet clinic became operational in 2008 at HQ, and also offers boarding. EMRO is an officially registered non-profit charity in Egypt, an NGO (non-governmental organization) with charitable number #6196, effective since August 23, 2005. EMRO has a small staff and volunteers, and we depend solely upon the support of private and corporate donors, as well as income from the Vet Clinic. The governing Board of Directors steer EMRO's direction. For inquiries about EMRO, please contact the EMRO Manager, Mr. Mostafa Nagy, at info@emaurescue.org. Ms. Gloria Lauris, M.A., B.A. Ms. Lauris has her advanced degree in Sociology in Canada and has worked for over ten years as an analyst and project coordinator for public and private sectors. In addition, she has several years education training and experience as a teacher for ESL. She has led various fundraising activities for health and charity causes. She is also a certified practioner of electro-crystal therapy, which she uses as a supplementary healing therapy for sick or injured Maus. Ms. Lauris has a passion for cats in general, and specifically for Egyptian Maus. Dr. Ismail Elkholy, M.Eng., PhD, M.B.A.
A professional civil engineer by training, Dr. Elkholy has worked as a senior manager for Canadian National Railway (CN) for over 25 years. Presently he is working as an advisor in Saudi Arabia. He also has a Master's Certificate in Project Management. Dr. Elkholy has an interest in Egyptian Maus as part of his Egyptian culture and heritage (Egyptian-Canadian). Dr Elkholy passed away on November 4, 2013. To view his obituary, click Here.